These photographs show Philip B. Menninger, son of Dr. Will and Catherine (Cay) Menninger. He was a strong supporter and innovator of physical health activities at the Menninger Clinic in Topeka, Kansas. The Menninger Clinic as a sanitarium was established in 1925 with the purchase of a farm house and admittance of 12 patients. Their philosophy was that mental illness could be treated with an integrated medical, psychodynamic, and developmental approach for the total health of patients. It was located in Topeka, Kansas, from 1925 to 2003 and is now in Houston, Texas. 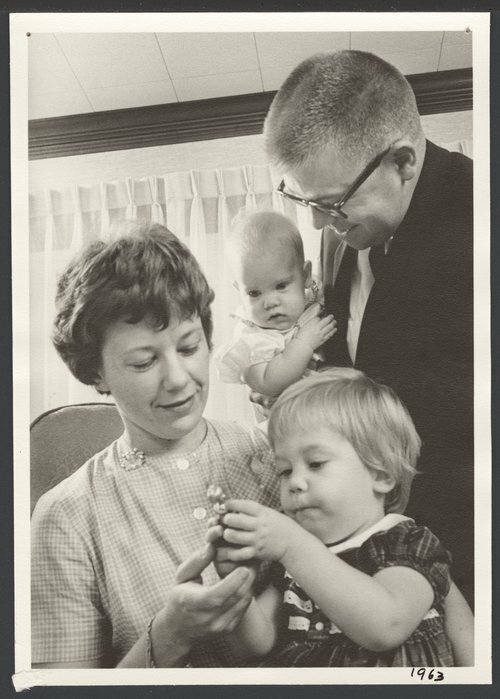 Philip B. Menninger - This photograph shows Phil, his wife Georgia and their young family in 1963.